Tag line: "The American Nightmare"
House Hunting, a 2013 horror / thriller about two families trapped inside a strange house, gets off to a great start, but quickly loses steam as the story progresses. Charlie Hays (Marc Singer), who’s looking to buy a new home, drives into the country with his second wife, Susan (Hayley DuMond), and his teenage daughter, Emmy (Janey Gioiosa), to check out a beautiful house situated in the middle of the woods. Once there, the Hays’ meet up with another family that’s also interested in this house: Don Thompson (Art LaFleur), his wife Leslie (Victoria Vance) and their son, Jason (Paul McGill). Things soon take a bizarre turn when a badly beaten girl (Rebekah Kennedy) comes stumbling out of the forest. What’s more, when Charlie and Don try to take her to the hospital, they find they’re unable to leave, ending up back at the house every time they drive away. 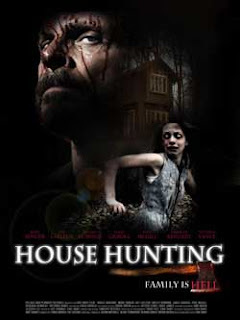 Left with no alternative, the families seek shelter inside the house, but as the days drag into weeks, they begin to turn on one another, unaware that it’s the ghost of the house’s previous owner (Joe Cobb) who’s keeping them there. But what exactly does this spirit want from them? At the outset, House Hunting had all the makings of an effective supernatural thriller, posing a number of intriguing questions to keep us on our toes (Why are they trapped? How long will it last?) There’s also plenty of tension as the Hays’ and Thompsons’ try to peacefully co-exist, only to find themselves at each other’s throats as the nightmare drags on. To top it off, there’s the occasional appearance of a ghostly figure, which only deepens the mystery. Unfortunately, director Eric Hunt does very little to sustain our interest throughout the film. Aside from a few surprises (one character is driven to suicide), the movie plods along at a painfully slow pace, never filling in the blanks or giving us so much as a hint as to what’s really going on. Well before the film was over, I found myself growing bored with it, and by the time it finally wrapped things up, I was beyond the point of caring.